Memory is a separate component of wisdom that is independent of education. Having a good memory alone will not allow you to pass Engineering courses. Jesus uses His memory to quote the Bible to Satan. Memorizing scripture can be very useful when defending your faith to others. You can also use your memory to make better decisions. If you can remember your experiences from 10 or 20 years ago, you can use that information to help you. 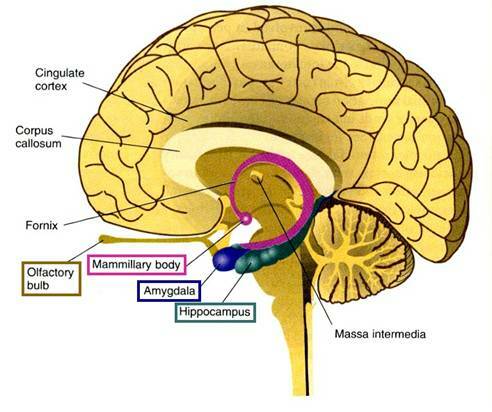 The main part of the brain responsible for memory is the hippocampus. Memory also involves the amygdala, striatum, and the mammillary bodies. (see picture below) There are three main types of memory: sensory, short-term, and long term. Sensory memory uses the five senses: sight, hearing, taste, smell, and touch. This type of memory is when you recall something only 200-500 milliseconds after you sense an object or sound. For example, if a child is show a picture of an apple very briefly, they can immediately pick the picture they were shown from a group of different pictures. Short term memory is when you recall something about 30-60 seconds later after only sensing it once. In 1956, George Miller found that an average person could remember a sequence of 7 numbers, which is why phone numbers are 7 digits. Long term memory is when you recall something from 20 minutes to years later. This is done with repetition which creates actual proteins stored in your hippocampus. Also, sleep helps analyze and process information so that it can be stored in your memory.